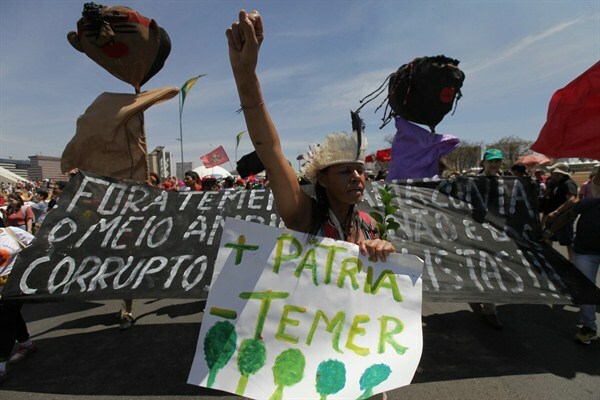 A demonstrator carries a poster that reads “More Motherland, Less Temer,” during a protest after an Independence Day military parade, Brasilia, Sept. 7, 2017 (AP photo by Eraldo Peres). In this week’s Trend Lines podcast, WPR’s editor-in-chief, Judah Grunstein, senior editor, Frederick Deknatel, and associate editor, Omar H. Rahman, discuss what Germany’s election results mean for Europe and the rise of populist nationalism on the continent, as well as Iraqi Kurdistan’s big leap forward for independence. For the Report, Ciara Long talks with Peter Dörrie about how Brazil’s economic downturn and austerity budgets are combining to undo the impressive gains the country previously made in poverty-reduction, while also jeopardizing the celebrated Bolsa Familia initiative that has helped move millions out of poverty since 2003. Can Macron and Merkel Really Save the European Union? Is Kurdish Independence From Iraq Impossible? Or Inevitable?